A few from Fridays "Pre Cruise". One week to go! While I was at the curb, a guy in a stopped car said, "Is this the Dream Cruise weekend?" I said, "No, it's next weekend, but it only get's worse from here on." 9 days to go & Woodward was already a parking lot in the curb lane at 7:30PM. I managed to get a few shots, though. All of them are at ISO 100 & 1/10 to 1/20th second. 5. I would have liked to get more like this one, but there just weren't many holes in the traffic that opened up at the right time. 7. ...and I got this one. It made my night. 8. This one, too. Normally I'd have binned it, but the expressions on their faces made the image for me. Those look pretty cool! Did you pan those on a tripod? 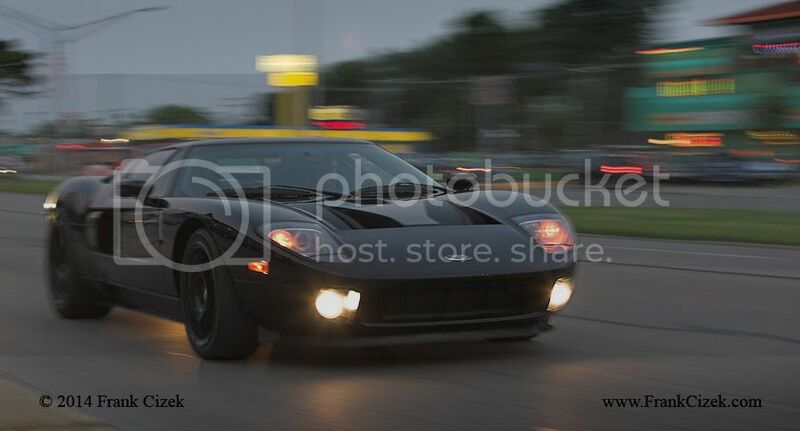 Even though, I don't live too far away from the Dream Cruise I have never went to see it. I have been tempted though, just never done it. No. I've thought about doing that just to reduce the vertical movement, but just haven't tried it yet. If you're close by, it's worth doing at least once. Take the 24-70 & 70-200 & stop by the Shell. You're almost guaranteed to get some great cars. The days leading up to the cruise are so much better than the actual cruise day IMO. I rode with a friend in his cream colored 67' Cadillac this past weekend. It was great to slow it down in some areas and then pick up to the speed limit in others. I'm looking forward to more cruise pics. I lived in Detroit in the '60s and used to cruise Woodward back then. It wasn't a big event back then of course but it was the place to cruise. Saturday? I'll look to see if I got a shot of it, but I don't remember it. Maybe next year for my 50th high school reunion.